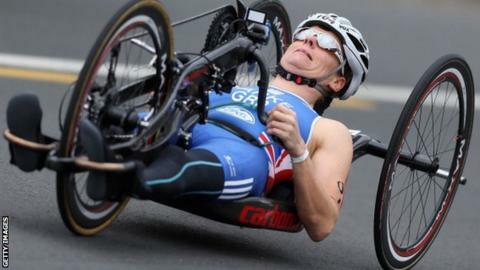 Britain's Karen Darke won her second medal in two days at the UCI Para-cycling Road World Cup in South Africa, adding silver in the H3 road race to her silver in Friday's time trial. The London 2012 medallist finished nearly five minutes behind Alicia Dana of the United States. Fellow Britons Craig McCann and Hannah Dines finished in fourth and fifth place in their respective T2 races. Britain's male and female tandem pairs both won time trial gold on Friday. The remainder of the GB team will compete in their road races on Sunday.